Tamil: காட்டு வேம்பூ Kattu vembhu. 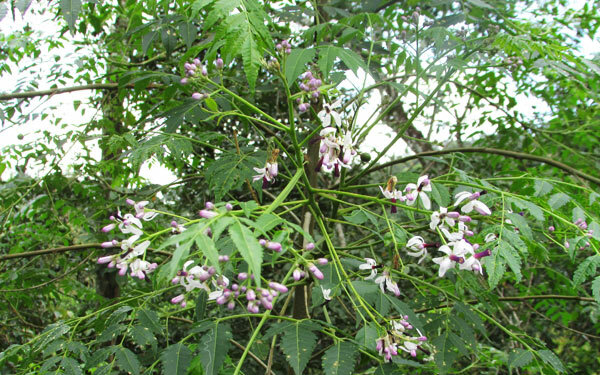 Indian lilac is a fast-growing deciduous tree reach the height of 5-7 meters, branching, leaves are bi-pinnate and sized 20 to 40 cm long, pale green leaflets about 3 to 8 cm long. Flowers are lilac or purplish, fragrant, star shaped born in clusters, bisexual flowers, both male and female flowers exist on the same tree. The fruits are green, roundish and commonly in a cluster, and sized 0.3 to 0.5 cm, yellow in color when they ripen.it is said to be poisonous. Anti fungal, Anti bacterial, antiviral. Chicken pox itching can reduce by rubbing of plants leaves gently, it is also capable of preventing infection, can prevent bleeding.